What happens when you move every 2 years, as we do, is that you begin to make bucket lists of things to do before you move again. We made one this summer with the boys. It’s on a piece of red construction paper and most of the items are crossed off: “camping” on the foldout bed on the back porch area, taking a tour of DC in a double-decker bus, going to the beach. Yesterday, we were going to cross another one from the list: going to the top of the Washington Monument. As we ate a late lunch yesterday, the boys and I talked about what it was going to be like to see the city spread out before us. What I love about the Washington Monument is not what it looks like, but what it does for the Mall. The Monument unfurls the sky, as if the Mall were a big circus tent with the most beautiful ceiling. I wanted to be inside that place and look out into all that blue air. But the earth was saying, yes. The floor began to roll and the heavy oak table splayed out from under me as if it were a young colt. I heard the kitchen cabinets bang open and the glasses fall out. “Let’s get Gus,” I told Oliver and we ran to the living room as the floor heaved beneath us. Gus began to cry and raised his arms to me. “The funder is hurting my ears,” he said. I picked him up and spun around, not sure what to do. I knew you are supposed to stand in a doorway, but I heard glass breaking and watched the light fixtures swing, so that didn’t seem like the greatest idea. Instead, I do what I do best. I ran. I took the boys out the front door and into our yard. As we stepped into the grass, the earth became still again. It was silent. I could feel Gus shaking in my arms, or maybe that was me. I told myself that there was nothing to be afraid of, but there was an eerie sense of deja vu to the whole experience, as if I had done this before. As if this were not the first time I stood in my front yard after the earth shook itself off like a wet dog. Down the block some kids had come out of their homes. Across the street, I saw my neighbor Paul huddled by his front door with his tiny little dog. Every neighborhood has a bright, happy person, the one in the old convertible who loans you his lawn mower and always gives you a big wave. Paul’s that guy. He’s not someone who hides out with a chihuahua. I waved to him and he came out of his house. “What was that?” he asked. Seriously, Dude? said the voice inside my head. “It was an earthquake,” I said out loud. “Are you sure?” he asked, stepping forward and down his steps. Ah, I thought. There it is. We each have our own unique epicenters of fear. After a few minutes of dusting ourselves off, we all went back inside. The boys were excited and kept telling me they weren’t scared. “I not stared of earthquakes Mommy,” Gus kept saying, so I told them that earthquakes hardly ever happened in Virginia. That it was over and we were all just fine. Oliver wanted to know what caused an earthquake and I told him that sometimes the planet settles a little and then goes back to normal. I had no idea what I could say that would bring comfort. I couldn’t tell them it would never happen again because what if it did? I went back into the kitchen to clean up the glass on the floor, but really, it was an excuse to take a breath and stop shaking. It didn’t work. For the rest of the day, I felt as if I were choking back sobs that had nothing to do with the earthquake. It took me until evening to figure out that maybe the strange sense of deja vu I felt had something to do with moving every two years. I am someone who wants to put roots down more than anything, but I guess what I am supposed to learn is this lifetime is how to deal with being transplanted, how to be shaken up a little. All day yesterday, I kept telling myself how unfounded these fears were. That what I was afraid of had already happened to me: the earthquake, the difficult moves, the loneliness. Right now I am fine, I kept telling myself. We’re all just fine. We would move again and we would be fine there too. We always found a doctor when we needed one, a school, and enough friends. I like to think that moving so often has made me into a certain kind of person. As Dominique Browning so eloquently put it, moving puts me on the other side of the desk. As I get lost in an attempt to buy milk or as my heart breaks as my son tells me that he misses his friends, that he is so scared of starting a new school that it feels like lions are chasing him, I become everyone who has ever been scared or lonely or lost. I become the woman who holds up the line in the grocery store because the cashier doesn’t know how to take food stamps. I become the elderly man who keeps asking you to repeat yourself. I become the child who is having a tantrum because he can’t tie his shoe. I tell myself that moving so often has made me compassionate. It has made me strong, good in a crisis. It has made me into someone who, in a fire or a hurricane or an earthquake, will grab the laptop and the diaper bag, the extra bottle of water. Yesterday, as the boys and I stood in our front yard after the ground stopped moving, I looked down at the chipped polish on my bare toes. Oliver was in his socks and Gus had a dirty diaper. Apparently I am not the person I thought I was. It turns out, I am the person, who, in a fire or a hurricane or an earthquake, doesn’t even remember her shoes. It turns out that maybe the only thing fear has taught me is how to be afraid. 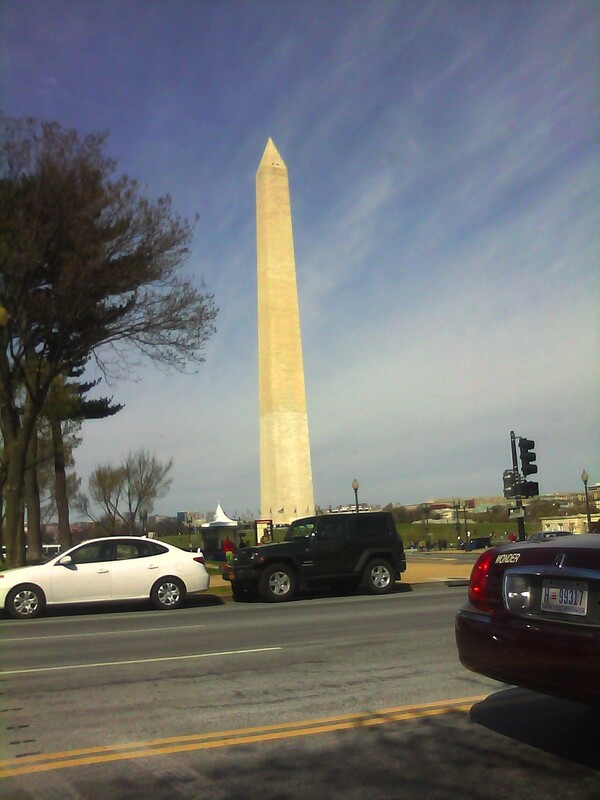 At three o’clock yesterday, an hour after the earthquake, they closed the Washington Monument. Today, all the buildings on the Mall were closed. The earth is still now, but they are checking for damages. They are looking for cracks and picking up rubble from the Cathedral floor. Thich Nhat Hanh writes that the miracle is not to walk on water. The miracle is to walk on the green earth, dwelling deeply in the present moment. It is clear that there is so much more work for me to do here, on this ground level. I am not ready yet to climb into a tall, slim obelisk and look out over the world. What I still need to learn is how to be comfortable with the earth shifting under my feet. I’m so glad you are all okay. I am nodding my head yes yes yes to everything you’ve said here. Thank you so much, Pamela, for this thoughtful and honest essay. What a scary experience for both you and your family. (Who wouldn’t be fearful in the midst of all that shaking?). It seems such a paradox and such a feat, doesn’t it, to be grounded in groundlessness? But it sounds like you’re doing it beautifully. I am reminded daily to “rest the fearful mind in the cradle of lovingkindness.” Where else should it rest, if not there? Hope all is well! Oh, my gosh. Pamela, you were there on 9/11? Oh, god. Your babies. So glad you are OK. I keep thinking, over and over, Pamela, that what if you and your family don’t have to move every 2 years? What if there’s some other possibility? I’m so deeply moved by what you’ve written here and wish with all my heart that the lessons you need to learn don’t have to come forever at such a high price. The great thing about moving is that you can reinvent yourself everytime, but the most difficult thing I found about being a TCK was not knowing the foundations of life in a given place. When I went back to Scotland for example, I looked the same as everyone, sounded the same as everyone and yet didn’t know how to buy a stamp at the postoffice. When you learn the foundations of one place you can be left feeling rather disabled in a new place not knowing all the rules. I’m always shocked how this can happen simply by moving across State lines as well. Moving is a great enforced lesson in letting go and accepting the present moment though! Sorry to hear you didn’t get to see out the top of the monument. But, like you said, it’s possible your feet need to stay grounded for a little bit. Love that quote by Thay. I hear you, and while I want to reassure you that there has to be another way, that might not be true. Maybe this is your way, your path. And paths are not always smooth, are they? So this is what I do know to be true: I am so glad you moved here to Virginia, and that for a little while, we are walking together. And I am glad that you are here, in the Wireless World, where we all meet, over and over. I wonder if you move so that more of us have the privilege of knowing you and all your boys. I ran to the top of the Washington Monument once. What did it get me? I don’t even remember what it looked like at the top. I wish I could write like you. Oh boy….yes, the ground is always shifting. You just have to literally move and have earthquakes! I am so glad you are safe. You learn from everything, don’t you? Beautiful you. Way to make an earthquake eloquent! This is beautiful! I’m glad you all are okay. You’re right, the ground is always shifting, literally and figuratively. I struggle to walk it without fear–daily, hourly, minute-by-minute. While we all have our personal epicenters of terror, we also have a collective on, the primitive fight/run/freeze brain. When triggered we are beyond human, we are Darwinian brilliance in action (and the old school runners that we all are, underneath it all, are born to run without shoes). Perhaps you don’t merely “walk” on your hands, but branch from them into the canopy of our ephemeral material existence—perhaps your true roots are in some cosmic “heaven” from which we come, trailing clouds of glory, at least as babies (as Wordsworth puts it). Perhaps that’s why ancient shamans would dig up a tree and plant it branches down and declare it the World Tree, the conduit between upper and lower worlds. Perhaps this relates to Kabbalah and the image of a divine tree growing down toward the up-growing mortal tree that we humans are? I wish you equanimity in the waves of rolling earth, time and relationships, I wish as much for all of us—and I’m most of all struck by the words of Gus, as the “Funder” is often hurting more than our ears. We smile and think enunciation… yet I think he got it quite right. I rarely respond to your writing right away because it stirs so much in me, I don’t know what to focus on. I have a friend, whom I have always hesitated telling you about. She is a military wife, and thrives in her role. I haven’t told you this because I read once that you wonder what is wrong with you that you don’t . And I get that too. One of the many reasons she thrives in this role, in my humble opinion, is that she was raised this way. Her father was in the military and they moved often. She has tales of Germany and Thaliand and New York and Georgia…..and on and on. Until now, today after reading your essay, I never considered her mother. I wonder how she felt about it all. My friend just moved again, and I’m not exactly sure where. (Oh, I wonder if its DC?) She does this every few years, picks up, and immediately makes a home in a new place. Often she lives in Military housing, which creates an instant community. She says she has a community no matter what, because everyone moves all the time and they dont waste time with things that don’t matter. They all know they have little time and lets get down to business in making a home and community. Despite her constant moves, she was raised with confidence and love and community and stability. And she knows how to make a safe haven for her children. I think you do just that and more. By making your lists, you make an effort to do what needs to be done before you move away. You are more present in the day to day than most because you are so intuned to it. You work so hard at bettering yourself and making a nice life for those lucky boys. I think the task of being comfortable with the ground shaking under our feet is impossible. (literally or figuratively). Just because you have fears or get frustrated and snap at your kids, doesn’t mean you aren’t living in the moment. It means you are human. I am so glad yall are safe. Beautiful! Thank you. I followed a link from Writing My Way Sober here, and I’ve found a new blog to follow! “It turns out that maybe the only thing fear has taught me is how to be afraid.” Sometimes that’s the only thing we’re supposed to learn from anything: How to wait, by waiting. How to be broken, by being broken. How to just be here with whatever it is we are. I learned that help will always be there. It won’t always be who or what I expect. I may not even recognize it when it comes. But it’s there and all I have to do is listen for it, and wait. And that is my definition of grace. I haven’t been online much in the past week, so I missed this – though not the news of the earthquake, certainly. All I can say is that you have written out these fears into some sort of weave we can all wrap around ourselves. Loving is fear. Being alone is fear. Taking risk is fear and so is not taking risk. Being able to imagine the fear of others makes you wiser and more compassionate and surely that is part of what you bring to your own experiences, your partnering, your mothering. A beautiful piece of writing. Oh how I have missed you, this place, and your intense and evocative searching wisdome. Your words move me, and make me think and remind me that we are never alone in our journey’s, no matter how different they may be. You are right, life is about learning to live with how the worlds shakes out for us, and just realizing that is more than most ever know. I hope you can remember that, and know that no matter when or where you move, we are here for you here, and now. You are currently reading Shaking at Walking on My Hands.